I’ve always wondered: why do our computing devices seem to slow down? Your gadgets might slow down if they’re bloated with apps. Plenty of misconceptions and conspiracy theories surround this topic. Internet searches for “iPhone slow” spike after the release of a new-generation model, but there’s no evidence to suggest that manufacturers deliberately degrade the performance of older devices with software updates. Computer hardware does not typically slow down over its useful life. Instead, there are several other reasons why smartphones, tablets and PCs start to seem less snappy. The good news is that you can often take steps to improve your existing device’s performance. Each time they update, apps typically become larger and more full of features. Visual pizzazz is also a major attraction, and so desktop and mobile operating systems periodically receive significant redesigns. All that extra functionality and glitz requires your device to do more computation than it did when it arrived home from the store. Given that it doesn’t magically speed up to compensate, it has less spare capacity available to respond to you quickly. Newer apps not only tend to do more computation, they also usually take up more space in your device’s storage. Devices only have a limited amount of fast “Random Access Memory” (RAM) available. One of a device’s data storage components, RAM is the rough equivalent of an office whiteboard – fast and convenient, but limited in capacity. Its contents are wiped every time you switch your device off. When it runs out of space in RAM, your device can shift things to and from the much slower (and permanent until explicitly erased) data storage, flash memory, which takes considerable time. In older PCs with mechanical hard disks, this used to be called “thrashing”, as users heard the hard disk’s read-write heads moving across the platters as they waited for data to be shifted in and out of the filled-up RAM. Flash memory is silent and much faster than magnetic hard disks ever were, but it is still orders of magnitude slower than RAM. Random Access Memory is a form of data storage. To make their apps run faster, some designers make them store copies of things in RAM that they think the user might want to see again to speed things up. For instance, a web browser might retain a copy of what the content in each tab looks like, even if only one tab is visible at a given moment. Known as cacheing, this makes things work much faster – until your system starts to run out of memory. For cacheing to be effective, the amount of space devoted to it must be carefully managed by the application and the device’s operating system. Some app developers don’t put the effort that they should into doing this well, and their applications not only slow down over time, but can drag the rest of the system down with them too. It’s also not uncommon for useful software to be accompanied by “crapware” – less-than-useful add-ons like browser toolbars – that use system resources and impact performance. Additional software can slow a system down in many ways: filling up permanent storage, using up more precious RAM, and using the computer’s central processing unit “in the background” without you noticing. All these factors can result in the system having fewer resources available to respond to you promptly. A new or factory-reset device tends to have less of this accumulated “cruft” (unwanted data and software) installed, and therefore has more resources available to do the tasks that a user actually wants. Another unpleasant possibility is that some of the computing capabilities of your device are being used by malware – whether viruses, worms or other varieties of malicious software. You’re not going to be able to match the performance of the latest and greatest high-end smartphone, tablet, or PC with an older model, as newer devices generally have fundamentally faster components. But with a small amount of effort, you can get the most out of your existing device. Whether you’re using a phone, tablet, PC or Mac, the most useful zero-cost action you can take is to uninstall unnecessary apps and add-ons. However, in some circumstances it may be easier – AFTER carefully backing up all your data – to simply perform the equivalent of a factory reset and reinstall the operating system from scratch, adding only the apps you actually need. Think of your router as the post office for the internet. Most of us would be bereft without Wi-Fi but give a little thought to the technology that beams us the internet. The device we pay so little attention to is called a router. Its main role is to connect networks and send and receive data from an internet provider. But many routers aren’t particularly secure. The importance of understanding how routers work and how to protect them from malicious attacks was highlighted by WikiLeaks’s recent revelations about the existence of an alleged CIA hacking tool, code named “CherryBlossom”. This tool can apparently hack routers, allowing the perpetrator to monitor traffic and perform software exploits on victims. The average person is unlikely to be targeted by this level of attack. But if you’re going to have a router at home, it’s important to understand exactly how it works. A router is like a post office for the internet: it acts as a dispatcher, choosing the fastest and most effective delivery paths. Then data will begin to travel between the two devices and you’ll hear the requested song playing through your smartphone. Trace route from Telstra.net to Spotify.com. 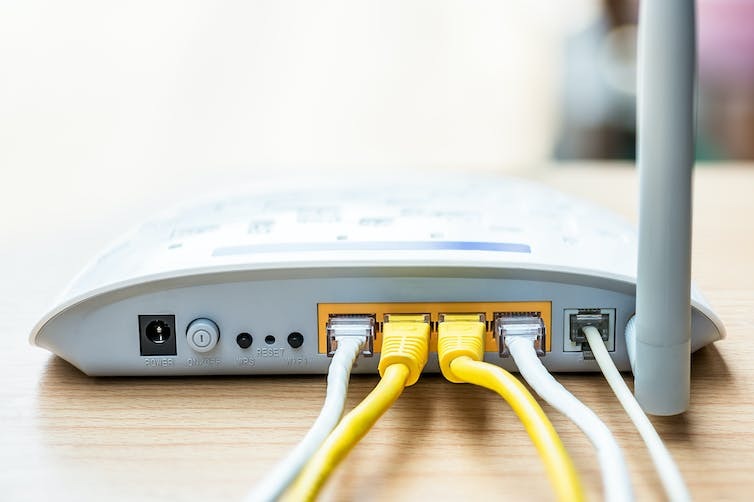 Ethernet ports: these exist to enable hard wired networking to the router itself in cases where a Wi-Fi connection is not possible. SSID: this refers to “Service Set Identifier”, and is an alphanumeric set of characters that act as your Wi-Fi network’s identifier. 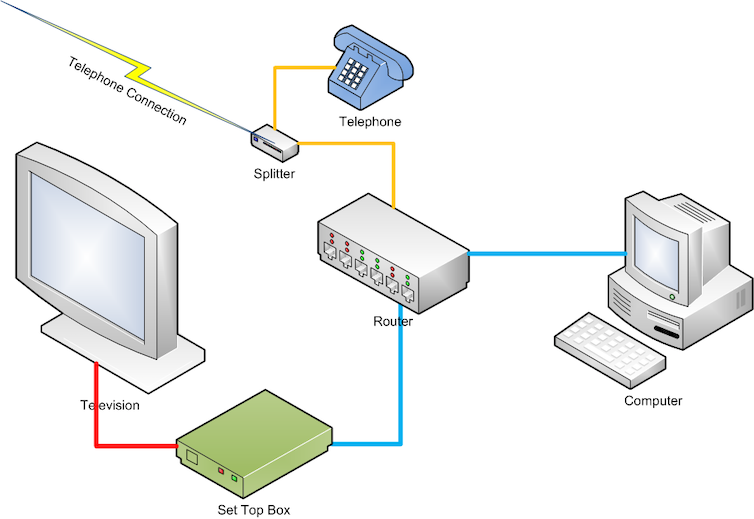 Telephone/internet port: this port allows your router to gain a hard wired (RJ-45) connection to the internet, usually through telephone lines. Routers handle interconnectivity and delivery. WPS: this stands for “Wi-Fi Protected Setup”. It allows users faster and easier access to Wi-Fi, because they will not have to enter in the passkey once pushed. LAN: a “Local Area Network” refers to a grouping of computers and devices being networked together, typically with cables and routers in a singular space – often a university, small company or even just at home. WAN: when we take a series of geographically distributed LANs and connect them together with routers, this is what we call a “Wide Area Network”. This is useful for larger companies that want to connect all their office locations together. 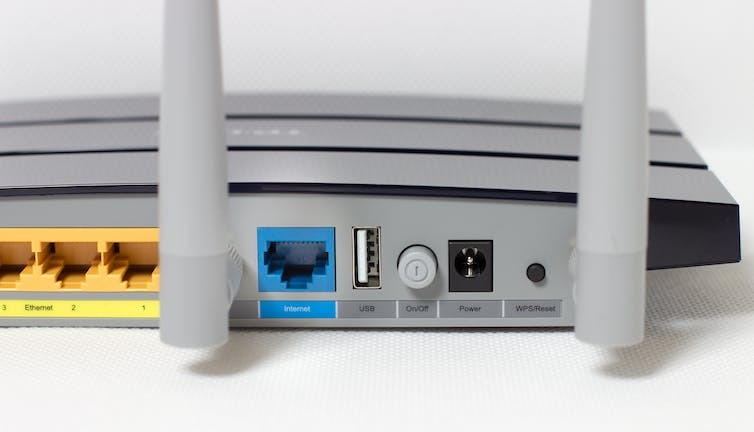 WLAN: closely related to a LAN, “Wireless Local Area Networks” are LANs whereby users who are on mobile devices can connect through a Wi-Fi connection, allowing complete mobility and thus reducing the need for any cables. The back of a router. It’s important to protect your router and Wi-Fi network from being compromised. ensure your router’s firmware – the software that’s hard coded into your router – is up to date. Routers ensure your home and internet service provider can stay connected. Look after your router, and it will (hopefully) look after you. Uzbekistan has continued short-term jailings of religious minorities, with three Protestant Christians from a registered church being given 15 day jail terms,Forum 18 News Service has learnt. Three other Protestants – arrested after a raid on the Tashkent church – were each fined 80 times the minimum monthly wage, and two other Protestants were fined five times the minimum monthly wage. Six computers seized during the raid were ordered to be given to the state, and seized Christian literature ordered destroyed. "Everyone was shocked at the verdict because the defendants proved in court that they were innocent and there were so many violations of legal procedure," one Protestant told Forum 18. Unusually the court sat into the evening and the sentences were given at about 10.30 pm local time. Among other recent punishments for "illegal" religious literature, one Baptist has been fined 20 times the monthly minimum wage and his religious literature – including the New Testament – was ordered to be destroyed. The trial followed a massive 16 May raid on the centrally-located Tashkent church. The court ordered that Christian books confiscated during the raid be destroyed. The church building is sealed. Half of those arrested in recent months could face apostasy charges. ISTANBUL, January 28 (CDN) — At least 14 Christians have been detained in Iranian prisons for weeks without legal counsel in the past few months as last year’s crackdown has continued, sources said. Three Christians remained in detention at Evin prison after authorities arrested them along with 12 others who had gathered for Christmas celebrations on Dec. 24 in a home 20 kilometers (12 miles) southeast of Iran’s capital, Tehran, according to a source who requested anonymity. While the others were released on Jan. 4, remaining at Evin prison were Maryam Jalili, Mitra Zahmati and Farzan Matin, according to the source. Jalili is married and has two children. Matin sounded ill in a short phone conversation this week to his family, the source said. Security forces went to the homes of all the detainees and confiscated their books, computers and other literature, according to Farsi Christian News Network. None of the Christians have had access to legal counsel or representation. The source said authorities have promised the release of the three Christians arrested Dec. 24 but have yet to let them go. “They called their families, and they were told they would be released after bail … but then they didn’t [release them],” he said of the three Christians held in Evin. Within days after the Dec. 24 arrest, Jalili’s sister, Mobina Jalili, and another Christian were arrested in Isfahan. The source said these two have had no contact with their families. The location and conditions of their detainment are unknown. In the southwestern city of Shiraz, seven Christians were being detained as of Jan. 11, another source said, and most of them may face charges of apostasy, or leaving Islam. Family members who have spoken with the arrested Christians said authorities have told the detainees – with the exception of one who was not born a Muslim – that they are guilty of apostasy, the source said. The names of those detained in Shiraz are Parviz Khaladj, Mehdi Furutan, Roxana Furouyi, Behrouz Sadegh-Khanjani, Abdol Reza Ali Haghnejad, Iman Farzad and one identified only as Mahyar. Another Christian in the northern city of Rasht, Davoot Nejatsabet, also has been arrested. And Yousef Nadarkhani, who was arrested last year on Oct. 13 in Rasht, remains in prison. The source said the government was in crisis with so many of its citizens continuing to openly protest against it, and that this was an opportune moment to lash out against Christians. Arrested Christians are regularly denied legal counsel. Often Christians are charged with other crimes, such as espionage or disrupting public order, because of their faith. The charged political climate in Iran has made it nearly impossible for Christians to find appropriate defense lawyers they can afford, a source said. Many of Iran’s human rights lawyers have either fled the country, the source said, are in prison or are otherwise unable to take up Christian cases. Under sharia (Islamic law), apostasy is one of several “crimes” punishable by death, although Islamic court judges are not required to hand down such a sentence. No converts to Christianity have been convicted of apostasy since international pressure forced officials to drop the death sentence of Christian convert Mehdi Dibaj in 1994. In the years following the convert’s release, however, Dibaj and four other Protestant pastors, including converts and those working with them, have been murdered. The murderers of the Christians have never been brought to justice, and government officials are suspected of playing a role in the killings. Governmental and non-governmental agencies say that Christian converts are regularly placed under surveillance, arrested, imprisoned without due process and tortured. Muslim-born Iranians who have embraced Christianity are legally prohibited from practicing their newfound faith.